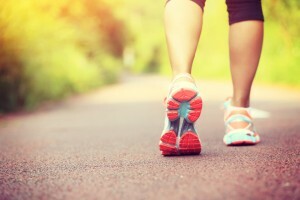 Can Exercise Improve Varicose Vein Treatment? Can Exercise Improve Varicose Vein Treatment and Other Vein Problems? Varicose veins and other vein problems affect millions of people. While some of these problems are cosmetic in nature, others can cause health issues, such as cramping, persistent pain and swelling. Exercise can play an important role in varicose vein treatment and in treatments for other types of vein problems, such as chronic venous insufficiency (CVI). Those with CVI or other vein problems typically have poor circulation between the veins in their legs and their heart. This is what leads to symptoms of CVI, such as leg heaviness, aches, ulcers and the development of varicose veins. Certain types of exercises help make calf muscles stronger, which improves circulation from veins in the legs to the heart and relieves symptoms. Patients with varicose veins or CVI can benefit from doing exercises that keep the blood pumping effectively between the calf muscles and heart. These types of exercises include those that give the legs a good workout while performing smooth motions, such as going for a swim or taking a walk. Other types of exercises can be done throughout the day while sitting, which can benefit those who have a desk job. These include moving feet back and forth in a rocking motion, turning the ankles in a circular motion from time to time and moving legs up and down in a bouncing motion. The effects of these exercises can be improved when compression hose or socks are worn throughout the day as well. These types of garments help improve blood circulation in the legs. Those with vein problems should avoid doing certain types of exercises that put too much pressure on leg veins. Doing these exercises can increase the risk of developing varicose veins and CVI or make these conditions worse. Exercises to avoid doing include high-impact ones that involve the legs, such as running. Exercises that create additional pressure in the abdomen should also be avoided, since these can lead to increased pressure in the leg veins. These exercises include some types of yoga poses, sit-ups and crunches. Lifting weight should also be avoided, since it can put too much pressure on the abdominal region. If you have varicose veins, please contact Metropolitan Vein and Aesthetic Center. Call us at 914-295-2202 to set up a consultation for varicose vein treatment.